What Is The Boar’s Head And Yule Log Festival In Fort Worth? 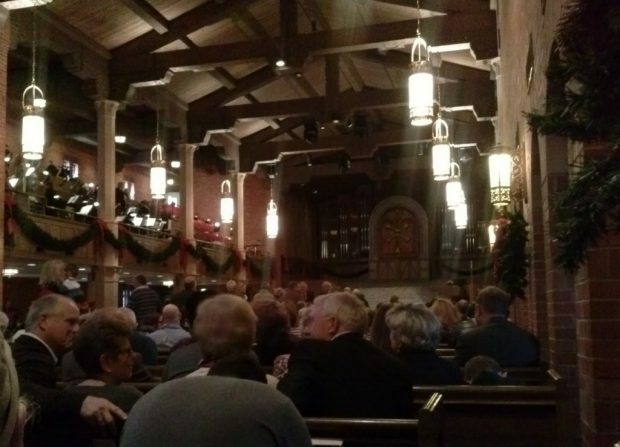 With only four performances over two days in January, it’s easy to miss the Boar’s Head and Yule Log Festival, a decades-long tradition at University Christian Church. But many people intentionally skip the event because they don’t understand what it is. Truthfully, it’s difficult to explain even for those who’ve attended several times. On Epiphany weekend at University Christian Church near TCU in Fort Worth, it’s all about the journey, not the destination. That’s because the annual Boar’s Head and Yule Log Festival — usually called simply “the Boar’s Head” by those in the know — is an event that never quite culminates. But a lot happens. More on that later. Simply put, it’s a festival of processions. People in lavish costumes wander around, generally in search of the Christ child. There’s music from handbells, soloists and an orchestra. It’s quaint, strange and charming. If the name suggests to you that this festival is something ancient, you’re on the right track. The festival is based on the legend of an Oxford student who kills a wild boar with a book of ancient philosophy when the unfortunate animal interrupts the presumably self-important student’s studies. A few churches around the world have turned the celebration of this so-called triumph into a Christian festival, giving it additional significant and added symbolism. As told at University Christian Church in Fort Worth, the boar represents evil that has been overcome by the teachings of Christ. The church has put on the festival every year since 1976. It concludes the 12 days of Christmas and is held on the weekend nearest Epiphany, January 6. A cast of brightly robed kings, peasants, Beefeaters, dancers and others join musicians from the Fort Worth Civic Orchestra to put on the event. Some 300 people participate while hundreds gather in the church’s sanctuary at 3 p.m. and 5 p.m. to watch. What do I mean that this festival never quite culminates? In most church events, the procession comes before the main event, but at the Boar’s Head, the procession is the event. It technically all culminates in the opening of some doors to view the baby Jesus and his family, but the show is about the processions of peasants and kings alike. When you attend the Boar’s Head, you’ll see a ritual that has changed very little since the church first started putting it on. Costumes have gotten brighter, many faces are different now, of course, and the music has been slightly updated, but it is essentially the same presentation. You can enter for free and no tickets are required, but paid reserved seating is available. I used to attend this event regularly but now find that a visit only every few years is plenty. Since I remember in great details the details that rarely change, attending every year isn’t essential or entertaining anymore. Still, this festival about the church overcoming evil influences is somehow still relevant and somehow still managing to draw full or nearly full houses for its four performances. To say that nothing ever happens during the Boar’s Head and Yule Log Festival is being unkind, but to say that there’s no culmination of the event and little satisfaction as it draws to a solemn but hopeful end is, unfortunately, accurate. Nevertheless, it’s a spectacle that everyone needs to see once — and then you can decide for yourself whether it’s worth experiencing again. Arrive an hour early for a good seat. Paid attendees sit at the front, but they miss much of the action. Since the size of the event is part of the spectacle and since all the players move up and down the aisles, the best seats are somewhere slightly back from the middle of the sanctuary. Attending the later presentation on either day may mean waiting outside to get in, and the weather is often cold that weekend. Attending the earlier one means you can walk right in. Photography is generally only allowed at the 3 p.m. event on Saturday. Call ahead to verify this if you plan to take any pictures.